Quality musicians that just love what they do…. and what they do is give your big day the party atmosphere your guests will talk about for years to come. Extremely experienced in the Wedding industry and know exactly how to keep your guests entertained, we have been filling dance floors for many years and take pride in making sure you and your guests truly enjoy your day. Based in Cork but have entertained guests at many weddings and events in Waterford, Tipperary, Limerick, Kerry and of course Cork city and county. With such diversity and the incredible talent and energy that they bring to every single stage, you can be absolutely sure that The Love Bugs will mesmerize you from the very first moment you hear their powerful sound. 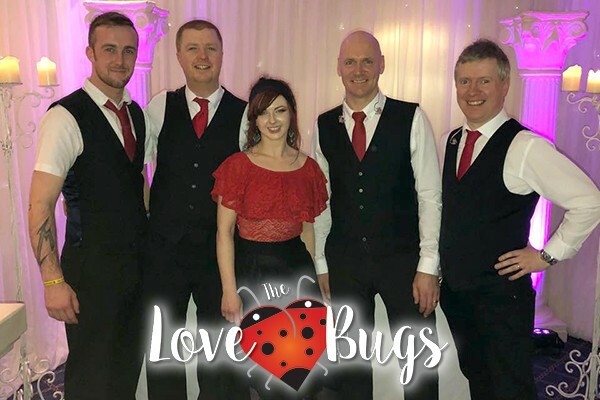 If you need a band that will really complete your wedding and help you create unforgettable memories, book The Love Bugs and turn your wedding day into a magnificent celebration that you will cherish forever.